It’s rude to talk about money. People in debt only have themselves to blame. Men are providers who don’t talk about their ‘feelings’, while women just can’t stop shopping! There are a huge number of stereotypes that surround debt and they are incredibly damaging. Not only does it stigmatise people in debt, but that stigma can stop them from seeking the IVA help or advice that they need. So what are these stereotypes and how are they wrong? There is a common understanding that women like to shop. This is not entirely untrue (although, like most things, it depends on the woman). However, there is a prevalent image in the media of women who are so mad about shopping that they cannot control themselves! The shopaholic who spends her husband’s hard earned cash is a stereotype we are all familiar with, but is this the reason that 64% of the 8.8 million people struggling with debt are women? No. The gender pay gap is a huge factor when it comes to getting into debt. In the USA, two thirds of student debt is carried by women. It is estimated that their debt burden is 14% higher in a given year than similarly educated men, who also earn 26% more than women – a percentage that only increases as time goes on. Similarly, in Britain, it is estimated that male apprentices earn on average £2000 more than their female counterparts.This all begs the question: how are women supposed to be able to pay back their loans, particularly loans needed for their education, if they are not earning the same as men? 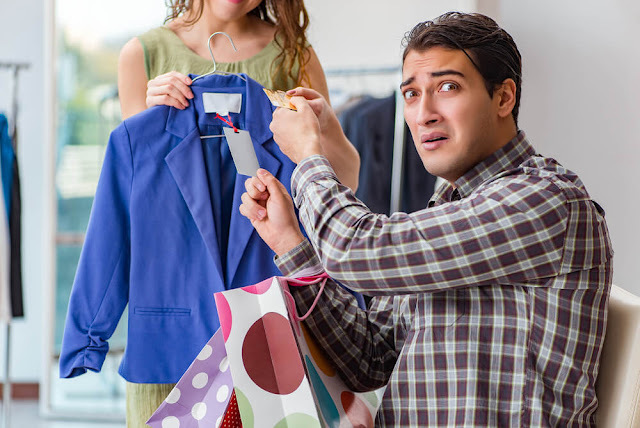 The myth of the shopaholic is not the only blame game that goes on in debt. Victorian attitudes persist and many believe that people in debt are in their position purely due to their own vices. They might be shopaholics, or they might be gamblers, or just have poor finance skills. The truth is, the fastest-growing reason to take out a loan is simplyto afford a car. Car dealerships have given 15% more loans this year than last year. While it is undeniable that over-spending is a factor in debt, the bigger picture is that we live in a culture of debt. Student loans are at £40-45,000, house prices are rising, children cost £230,000 to raise to their 21st birthday, and divorce is £70,000. Overall, it is estimated that the average Briton will have £309,000 of debt in their lifetime. The stats are very similar for the US, with citizens in their 40s still having over $33,000 in student loans to pay back and children costing $389,000 to raise to the age of 17. On top of this, disposable income increases are slow at just 1.1%, and wages are worth £20 less per week than they were before the 2008 financial crash. The Office of National Statistics has recently shown that the number of Britons facing ‘persistent’ poverty has grown by 700,000 in just one year. All of this compounds into what is sometimes called a ‘living standards crisis’. In the States, for example, it has recently been reported that it would be impossible for someone earning minimum wage of $7.25 to affordto live in a modest two-bedroom apartment in any location in the entire country. Only 12 counties have remotely affordable one-bedroom homes. If we are going to truly understand debt, we need to give up on the blame game. We need to understand the people who are struggling with debt, and understand how our culture actively encourages it. The most important issue surrounding the debt stigma is the effect that all these false stereotypes have on people coming forward and getting the help they need. Even though there are many options available to people in debt before bankruptcy, most people don’t come forward and seek help until they are thousands and thousands of pounds in debt. The charity, Christians Against Poverty, revealed recently that, on average, their clients come to them only after reaching debts of over £14,000 and that 1 in 10 of them do not have a bed to sleep on. They reported that their clients experience feelings of ‘shame’ and ‘fear’, and they felt ‘anxious and depressed’, and it is clear that these feelings, created by the stigma attached to debt, prevented them from coming forward to get help earlier. Nothing demonstrates this better than the stigmas that surround men. Men are not ‘supposed’ to need help. They are ‘supposed’ to provide for a family, and control any feelings of anxiety, depression, fear and shame. These stigmas result in men seeking help a lot later than women – when their debts are on average 9% higher and even harder to deal with. If we, as a society, were more comfortable talking about debt, maybe we could manage to get men to come forward earlier, without the unnecessary shame. Ultimately, we are all doing ourselves a huge disservice by being too scared to talk about debt because it means we won’t find any solutions. Women need to earn the same as men, wages in general need to be raised to the living standard, and both men and women need to feel that they can come forward and say ‘I need help’.